Already 4 months along over here! It seems like I’ve been pregnant for pretty much double that, but it’s also crazy that we’re under 5 months until this bambino is here! Here’s what’s going on at 4 months along. Size of Baby: About 6 inches long and 8.5 ounces…around the size of an heirloom tomato! Total Weight Gain/Loss: Finally starting to ease back up just a little bit. I lost 3-4 pounds during the 1st trimester, but I have gained that back and just a little bit more. 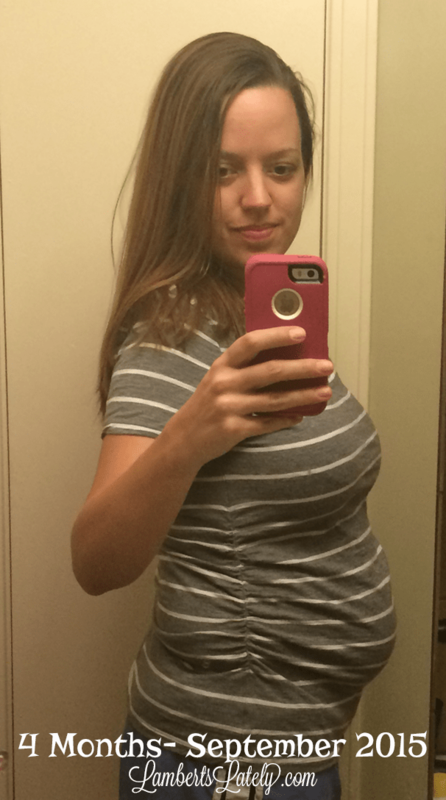 Depending on the scale, I’m up around 3-4 pounds from pre-pregnancy! Maternity Clothes: Oh yeah. I’m honestly in t-shirts/yoga pants most of the time, which still fit with no problem. But any “real” pants either require the rubber band trick or maternity pants. I can still get away with loose-fitting dresses and shirts. Gender: Noah and I both have a pretty strong hunch, but we don’t find out anything definite until next week! Movement: Yes, finally! I really thought I would start feeling it earlier than I did with Emmie, but it really happened at about the same time (around 16/17 weeks). Within the past week or so I’ve felt it so much that I can tell definite wake/sleep patterns. Still just tiny little jabs here and there! Sleep: Not bad at all! My morning sickness medicine makes me really sleepy, so sleep hasn’t been an issue at all…if anything, it’s that I can’t get enough. I’m still needing a nap most afternoons and sleep a solid 8-9 hours at night. Cravings: Not a lot…still battling morning sickness (see below). I would just about kill for a buffalo chicken sandwich from Which Wich, and I’ve loved Strawberry Limeades, Root Beer, and Icees. Symptoms: Morning sickness that just will. not. die. Seriously, it was gone by 12/13 weeks with Emmie…not so much this time. I’m not sick every single day, but I’d say a good 50% of the time I am nauseous enough to at least make me not eat. I have good days and bad days though…thank goodness I’m at least getting a break here and there. I’ve also had a little bit of anxiety creeping up. This isn’t something I’ve ever really talked about on the blog (or with anybody but close family and friends, for that matter), but I had a minor bout with postpartum anxiety after Emmie. When she was around 6 months old it really got to the point that I needed help with it…with help from great doctors though, we were able to treat it and it was no longer an issue. I’m already noticing it creeping in this time around (something my doctor said was normal for women who have experienced it before and can happen even before the baby is born). We obviously can’t treat it with medication right now, so it’s something we’re watching closely and treating with good old fashioned coping techniques for the time being. I’ve been planning a full post on this, maybe sometime soon I can go into more detail!